The Ducks have signed right wing Brian McGrattan to a one-year contract. Per club policy, no financial terms of the deal were disclosed. McGrattan, 29 (9/2/81), has appeared in 182 career NHL contests with Ottawa, Phoenix and Calgary, collecting 3-11=14 points with 395 penalty minutes (PIM). He most recently played with Calgary in 2009-10, scoring 1-3=4 points in 34 contests with 86 PIM. A native of Hamilton, Ontario, McGrattan appeared in a career-high 60 contests in 2005-06 with Ottawa, scoring 2-3=5 points with 141 PIM. The 6-4, 235-pound winger appeared in 59 contests with Syracuse and Providence of the American Hockey League (AHL) last season, scoring 10-5=15 points with 153 PIM. He opened his ninth professional season with Providence before being acquired by Anaheim along with Sean Zimmerman from Boston in exchange for Stefan Chaput and David Laliberte. 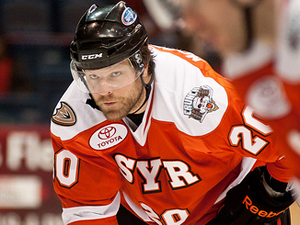 McGrattan spent the remainder of the season with Syracuse, earning 6-4=10 points with 56 PIM in 20 games. Selected by Los Angeles in the fourth round (104th overall) of the 1999 NHL Entry Draft, McGrattan has earned 35-27=62 points with 1,206 PIM in 256 career AHL contests.